The apartment, ca. 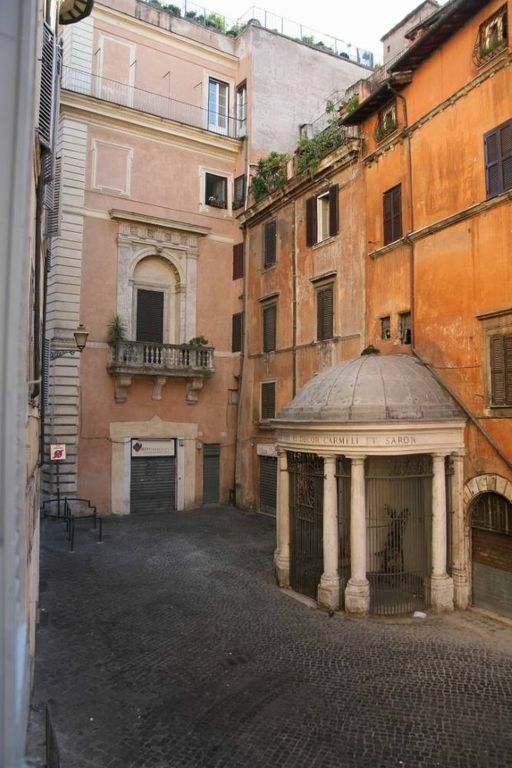 40 sqm, completely renovated, on the first floor, in a building of the seventeenth century., Is really at the center of Rome (as can be read from the testimony), in Piazza Costaguti 29. Between Largo Argentina (with the remains of ancient Roman Temples) and the Tiber Island, just a few hundred meters from Piazza Venezia, Pantheon, S. Louis of France (with the famous paintings of Caravaggio), Piazza Navona, Campo dei Fiori, Piazza Farnese, Via Giulia and the Theatre of Marcellus, the Roman Forum and Colosseum. And 'the ideal location for walking around the city center, continually discovering new, delicious angles from which to start to stop in many pizzerias, restaurants, pastry shops and ice cream parlors that offer an embarrassment of choice. You can visit on foot all the ancient city! We absolutely love our 4 nights here! To start, Emanuela is such a great communicator and met us late at night as our plane was delayed, in which we were most grateful. The neighborhood is charming and the apartment homey. If you want to experience an authentic experience in Rome this is the place. We enjoyed the sounds of kids playing in the streets, restaurants, music, talking etc. Everything is walking distance as we walked to all the major sites (google maps a lifesaver). If we return to Rome we would for sure stay here again! we thoroughly enjoyed our stay. the apartment is cozy, functional (ideal for couples) and located in one of rome's loveliest corners. also, very convenient for public transportation and taxis. the only thing that could be improved is storage space, especially if you think that most guests have large suitcases. Ringraziamo sia per la eccellente recensione sia per il suggerimento.... Compatibilmente con le ridotte dimensioni dell'appartamento cercheremo di trovare una soluzione al problema della sistemazione temporanea dei bagagli!!! Grazie anche per l'ordine in cui è stato lasciato l'appartamento! A great location in Rome that allows the visitor easy walking to sites, shopping and restaurants. The apartment has everything you need and Emanuela was gracious and helpful. It is a busy area with restaurants but we didn’t find the noise so distracting. We felt very safe in the area and walked about at night no problem. Try the gelato around the corner, it is great. Word to the wise, if using bus/tram, tickets need to be purchased before getting on the bus/tram at Tracchoria or newspaper stands (€1,50). You can’t buy tickets on the bus/tram. Ho letto il giudizio positivo espresso dai miei ospiti e li ringrazio. I read the positive opinion expressed by my guests and thank them. This is a very clean, comfortable, and convenient apartment. Centrally located to anything you would want to do in Rome, I truly enjoyed the apartment and everything about it. The host was very communicative and helpful with any questions that I had. I highly recommend this for a unique neighborhood for your stay in Rome. Come sempre, quando riceviamo una recensione completamente positiva (fortunatamente quasi sempre fino ad ora...), dobbiamo essere soprattutto grati ai nostri ospiti perchè questo ci spinge a fare e dare sempre più e meglio. Quando poi gli ospiti sono anche persone simpatiche e gentili, il lavoro si trasforma in piacere! As always, when we receive a completely positive review (fortunately almost always up to now ...), we must be especially grateful to our guests because this drives us to do and give more and better. When the guests are also nice and kind people, the work turns into pleasure! E' sempre molto gratificante ricevere testimonianze da persone che si sono mostrate da subito particolarmente educate e gentili. Questa testimonianza è ancora più importante per noi perché i nostri ospiti, quando hanno scelto il nostro apartamento, conoscevano perfettamente la zona (al centro di Roma) e quindi le possibilità che esso offriva. It is always very gratifying to receive testimonies from people who immediately showed themselves to be particularly polite and kind. This is even more important for us, because they chose our apartment, knowing perfectly the area (in the center of Rome) and therefore the possibilities it offers. The was the perfect location and perfect hostess! The apartment is charming, cozy, and has the perfect old world feeling to it - with all the modern conveniences! Apartment was very clean and cared for. I loved opening the windows every morning and watching the children go to school and smell the fresh pastries baking. Area was easily accessed from the airport and Emanuela was very good in assisting with perfect directions to give to the taxi. Restaurants, shopping and sightseeing were all within easy walking distance, but bus and tram are right 2 minutes walk around the corner. Bed is comfortable, hot water was fine, WiFi worked perfect. A Great historical building. I highly recommend. Our host was perfect: it was good to talk to her before and during his stay and get to know his impressions. It has created such a pleasant relationship: this is the most fascinating aspect of this work. it was our pleasure to help you solve small problems (currency, telephony) that a foreigner (especially non-European) often meets. Truly the guest who we hope to receive more! La nostra ospite è stata perfetta: è stato bello comunicare con lei prima e durante il suo soggiorno e conoscere le sue impressioni. Si è creato così un piacevole rapporto: è questo il lato più affascinante di questo lavoro. è stato un piacere poterla aiutare a risolvere i piccoli problemi (valuta, telefonia) che uno straniero (soprattutto non europeo) incontra spesso. Veramente l'ospite che ci auguriamo di ricevere sempre! To get to the apartment from Termini Station you can take bus # 64 or the fast line - three stops - 40 (remaining is just off the station) and get off at Largo Argentina (in front of Feltrinelli), cross the square (along the Teatro Argentina), take Via Arenula to Largo Arenula; the second street on the left is Via S. Wailing Maria, traveled which you find yourself in Piazza Costaguti It takes longer to describe the way in which travel the 200 m. that separate you from the bus stop to the apartment! La Tariffa standard di € 70 è per DUE persone. Tariffe in funzione del numero di persone: per ogni ospite aggiunto è previsto un supplemento di 15 € (massimo quattro persone totali). Tariffe scontate per soggiorni superiori alla settimana, Consegna delle chiavi da parte del Proprietario.